An evening fashion masterclass for those who want to connect and learn from senior leaders from the fashion and entertainment industry. Join our masterclass featuring an expert panel of successful leaders and find out how they got to the top. You will meet our senior specialists and hear their advice on growing your business or progressing your career in the industry. As a Creative Business Development Consultant Drapers Record, OHTV and The Guardian have spotlighted her for her creative business prowess. A visiting lecturer and alumni of University of the Arts London, (Central Saint Martins and The London College of Fashion), she received her PGCE in Teaching at Canterbury Christchurch University. Jennifer has been teaching for over 10 years online and offline and has an extensive business development background in fashion and creative industries. Jennifer has worked with The British Fashion Council, London Fashion Week, The Mayor of London, The Fashion and Textiles Museum, The Victoria and Albert Museum, and numerous creative businesses. She is the author of the Designer Manufacturer Handbook, a best Practice guide for producing garments – Published by the British Fashion Council. Oliver Morris, renowned as a creative leader within the Arts and Fashion elite and industries and who, for many years has infused his cutting edge signature and avant guard style of direction globally for prestigious magazines including a kaleidoscope of luxury brands and power house designers such as Dolce & Gabbana, Alexander McQueen, Giorgio Armani, Valentino, Tommy Hilfiger, Lamborghini, and Rio Ferdinand. A face and name synonymous with international fashion campaigns and catwalk shows, Rachel Radharani Henna Ritfeld is the embodiment of diversity — professionally and personally. Rachel beguiled viewers in the talked about Lynx Effect commercials in 2008. Rachel was the face of multi-millionaire entrepreneur Damon Dash’s Tiret watches in the UK and superstar R&B group Jagged Edge used her image for the top-selling album ‘Ghetto Guitar’. A Madame V lingerie campaign showed off her angelic expressions wrapped in spicy garb. Both L’Oreal and Tony & Guy featured Rachel’s glowing face and fantastically versatile locks while Firetrap, Jean Paul Gaultier, LaPerla, Babyphat and Rocawear sent her down the catwalk worldwide. London, Paris, New York and Spain were the backdrops and influences growing up with a mother who was a model and an International fashion tycoon for a father. Jennifer began her 14 year career in beauty as a professional makeup artist working with prestigious brands such as MAC, Laura Mercier, Space NK and Shu Uemura. Along with her fashion and beauty editorial background, she has also worked within corporate PR and media. Lisa is a dynamic, strong individual, with a colourful past, and a bold future. A chance call from a friend led to Lisa getting her first job in the music industry for an independent music PR company. It was not long before Lisa realised she had found her calling and quickly embraced her new role representing clients like Princess Superstar, Vikter Duplaix, Mark Morrison, Dionne Warwick, Suge Knight and DJ Jazzy Jeff. She had the opportunity to travel extensively and in the process built a strong network of industry contacts globally. Lisa was head hunted by Puma. Here she started off as Artist Liaison manager responsible for increasing the brands network of talent and exposure throughout Europe. She made strong relationships with bands like Kaiser Chiefs, Hard Fi, Basement Jaxx, Akon, Ludacris, Calvin Harris, Faithless and Paolo Nutini, It was not long before Lisa was promoted to manager and not long after that to run the department’s European Entertainment efforts. Now 10 years into the job Lisa’s focus is on the overall global strategy for the brand. She continues to work with talent and relationships include Rihanna, Deadmau5, Chris Hemsworth, Djimon Hounsou, Tyson Beckford, Professor Green and Jamal Edwards. She has also been responsible for a list of high profile events throughout her career and has programmed events like PUMA’s celebrations around the World Cup 2006 Berlin (Akon, Faithless), European Championships Vienna (New Young Pony Clubs, Robyn, Calvin Harris) as well as the 2012 London Olympics where she programmed the PUMA Yard in East London. From her career as an international model and dancer working with artists such as Ricky Martin, The Backstreet Boys and Take That, Aicha found her talent lay in naturally creating scenes and moves for artists with her first major assignment being that to create the feel of Kanye West Golddigger promotional campaign which culminated in the legendary Brit Awards performance that featured 80 gold covered girls. Aicha has choreographed some of the UKs most high profile shows and events including the London Olympics 2012 bringing together her sporting and creative successes to her home town. MTV European Music Awards where she was the resident choreographer for many years creating performances for all the artists and hosts of the show from major pop artists like Katie Perry to hip hop royalty Snoop Dogg, The Brit Awards and the Mobos for various artists. Her knowledge of the dance and fashion industry led her to start her own business with her two agencies AMCK Dance and AMCK Models under the umbrella of AMCK Management. The dance division which celebrates its tenth anniversary this year supplies dancers to the very best music artists worldwide including Pharrell, Beyonce, Madonna and Rihanna. AMCK Models is the first and only high fashion model agency in London that solely represents men and is listed within the top premium mens agencies in the world. The roster boasts top models with campaigns from Armani, Prada, DKNY to Vivienne Westwood. Her agencies have won industry awards and Aicha has been named as one of the top 50 influential black women in the UK today by the Power List. 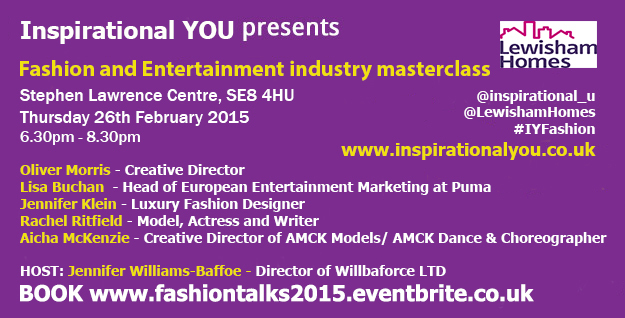 Do you want to grow your business or career in the fashion or entertainment industry? Do you have your own business or want to expand it? Do you want to work for one of the major fashion houses? Do you want to raise your profile? Do you want influential contacts in the fashion or entertainment industry? Do you want to work with well-known brands or A-list celebrities? Learn how our panel are balancing their success. Enjoy our informal networking session at the end of the evening. FREE places to Lewisham Homes residents.